We work in Partnership with New Zealand’s finest Wine Producers and Leading Retailers, supporting them with specialist Direct to International Consumer distribution services. The provision of highest quality export and import services enables our Participating Partners to sell directly, to their customers around the globe. We operate with consistent and transparent procedures to all major destinations. Our committed team hold vast expertise and experience in export, logistics and wine sales. In co-operation with our destination import agents, we manage the entire export process including NZ export documentation, destination import clearance, tax & duty payment and final delivery to your customer's door. We provide specialised wine export packaging, every bottle is handled with care to ensure a safe and timely delivery to your customer. Outside of our core Logistics service, we can also offer support with developing your online e-commerce sales, Wine Clubs, comprehensive reporting and many other value-added services. NB: We encourage wine consumers to buy wine directly from our participating wineries & retailers. 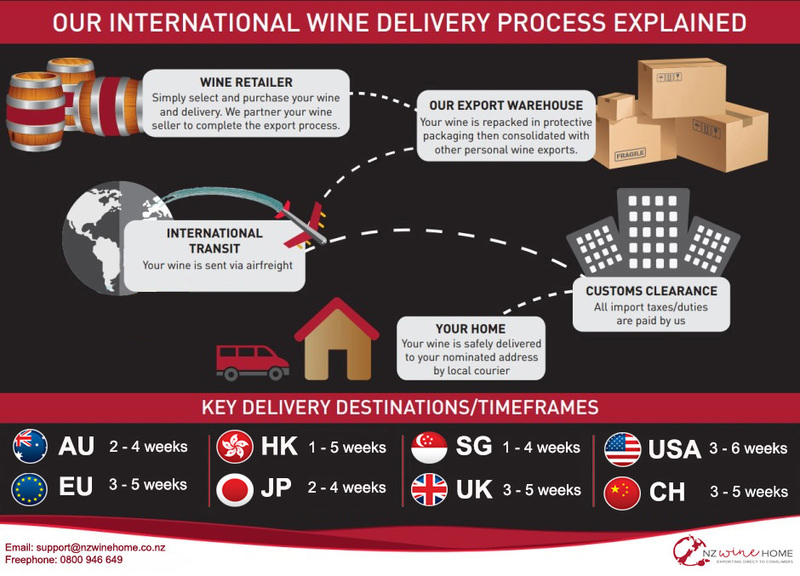 When this occurs wineries & retailers will complete export processing with us directly. There are occasions where consumers have already purchased wines and we therefore provide a personal delivery service option for these requirements. The costs of such service are considerably greater than via the commercial delivery. If you wish to view these costs, visit the personal delivery section and click on "book export". Export fees will show when a country is selected on the drop down list.